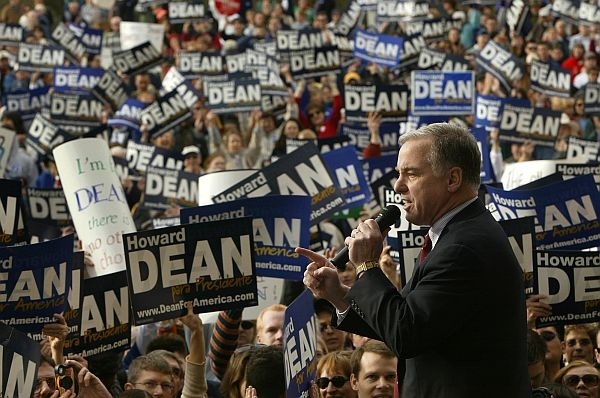 Deaniacs, and others who the only thing you know about Howard Dean is the scream, check out the totally awesome website, DFA-10. It’s hard to believe that Democracy for America [and Blog for Iowa April 1st] is turning 10 years old this week. We’re so excited to celebrate this huge milestone in DFA history — and we’ve got a wonderful surprise to share with you. Today, DFA is launching our 10th Anniversary website dedicated to celebrating our last decade of people-powered grassroots activism. The site is chock full of cool memories — check it out! Over the last few months, we’ve spent a lot of time looking through old pictures and videos remembering where we’ve been, what we’ve accomplished, and the friends and allies we’ve worked with along the way. As I traveled across the country last week with Gov. Howard Dean, celebrating with DFA members from Austin to San Francisco, I was reminded why DFA’s story can’t be told in pictures or videos alone. DFA’s story is YOUR story, shared on barstools and in union halls from Chicago to Burlington — of friendships made, battles fought, and victories hard won. That’s why our 10th Anniversary website is NOT complete yet. We’re still missing one very important thing: YOUR STORIES. After all, DFA’s history is YOUR history. We’ve made it this far and accomplished this much because of dedicated DFA members and leaders like you. We want to hear your DFA story and the impact Gov. Dean or DFA has had on your life: events you’ve loved, campaigns that fired you up and elections we’ve won together. Creating this site has been a really fun walk down memory lane, and it’s been inspiring to be reminded of how much we’ve done, when thinking of where we will go from here. So many of DFA’s greatest highlights over the years — starting with Gov. Dean’s inaugural DFA kick-off speech in 2004 — are on the site to watch and remember. We’ve accomplished so much together. But for those of us working for you at DFA headquarters, we’re most proud of the way we’ve been able to support, grow and sustain our movement. The same energy that drew all of us to the Dean for America campaign in 2004 keeps DFA members motivated and engaged today — and ten years later we still know that the power to change our communities and our country is right here in our hands. If you’ve been inspired by the empowerment ethos of Gov. Dean or the grassroots fighting spirit of DFA — or if you’ve worked with us on a memorable campaign or election in the last ten years — please share your story on our 10th Anniversary website today. Thanks for a wonderful decade and many more change-making years to come. Together, we’re unstoppable. This entry was posted in Democracy for America and tagged Democray for America, DFA, Howard Dean. Bookmark the permalink.